It’s hard to be taken seriously when you’re an artist, any kind of artist, especially when economic times get rough. People who aren’t writers often don’t understand how hard it can be to write. Some days, writing can be so fun and easy you could do it 24 hours a day, 7 days a week, 365 days a year and it would be pure bliss. Other days, doing dentistry on a megalodon shark without the use of Novocaine sounds pleasant in comparison. 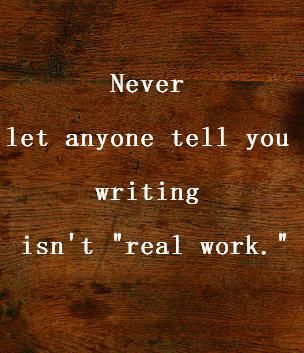 And just because writing is hard work doesn’t mean that it’s necessarily drudgery. It can be fun, hopefully more often than when it isn’t. But it is work. You’re spending time creating something out of nothing. You’re researching how to make that something seem realistic (or to get your details right if it’s nonfiction). And you have to fight all the distractions from external sources (day job, kids, housekeeping, food, sleep, social life) and internal sources (self-doubt, procrastination, bad advice, laziness, exhaustion, the internet). We have to keep on task in a world that is getting more and more fragmented as it demands our attention in fifteen different places all at once and it wants you to pay attention RIGHT THIS SECOND CHECK THE THING CHECK THE THING! Shutting all of that out is hard. Creating something that doesn’t make you want to hurl your computer out the window along with the shattered remains of your self-esteem is hard. Dealing with the uncomprehending stares, sniggers, and put-downs from people who just don’t get it (or who get a perverse pleasure from being malicious) is hard. As writers, we go through all of this to craft something whose success or failure is totally at the mercy of the whims of hundreds of strangers. And the fact that you keep going in the face of all these these obstacles deserves as much respect as the 9-5 careers that other folks have. Never let anyone tell you different. Thank you, Patti! I’m glad you found them useful! Great advice and encouragement! You made me smile with empathy. Then wince. Then smile again. Thanks for sharing. Thank you, Sara! I’m glad that this entry resonated with you and encouraged you. Thanks for stopping by! Kat – it’s so true. It is like all the arts a glorious (mostly) unpaid vocation, a calling but it is definitely work. I have to remind myself of that sometimes. It’s easy to slip into the thought process of: “But this is writing! I’m not digging ditches or mining coal…so why is this so hard? I shouldn’t complain.” But then I have to step back and, like you said, remind myself that this is a vocation and it is work. Nothing wrong with that. Thanks for stopping by and commenting! Thank you very much, Ruth! I hope that maybe some of the books on the list will be helpful; I always love reading about the thought processes and routines that other writers use. And thank you for hosting, visiting, and commenting! Kat, you’re very welcome 🙂 I am really enjoying learning from everyone. “Other days, doing dentistry on a megalodon shark without the use of Novocaine sounds pleasant in comparison.” Ha! You are so right, Kat. I love the images. Great post! ^_^ Thank you very much! Glad you liked the images, and thanks for stopping by to comment! Truer words could not have been spoken about art. I’ve met many different artists from many different genres and they will agree that our work is under-appreciated. Thanks! You’re welcome, I.O! Thank you for reading and commenting! Thanks, Tracy! I hope you find them useful. Thanks for all the encouraging infographics and resources you’ve shared. I’m sure you’re in for a successful career with your can-do attitude. You’re welcome, Violet! I hope you found them useful. And thank you for your kind words; I hope that readers and publishers agree with you. Happy writing! Yes, it is work… on those shark-wrestling days, I remind myself that I’d still rather be writing than cleaning toilets (even if that pays better). As Sara Davison says, press on! Amen, Janet. I worked as a cleaning lady for 3 years, so I feel your pain. Writing is hard, but much better than that! Thanks for stopping by and commenting!